Profits at Tesco have jumped 28% in what the UK's biggest supermarket chain described as an "uncertain" market. Chief executive Dave Lewis said the group was on track to meet the "vast majority" of the turnaround goals he set when he was appointed four years ago after an accounting scandal. The group said its performance was "strong", and Tesco has almost doubled its dividend. Full-year pre-tax profits were £1.7bn, with Tesco's same store sales up 1.7%. "After four years we have met, or are about to meet, the vast majority of our turnaround goals. I'm very confident that we will complete the journey in 2019/2020," said Mr Lewis, who oversaw the takeover of wholesaler Booker in 2017. "I'm delighted with the broad-based improvement across the business," he said. Overall like-for-like sales (which strip out changes to stores) rose 2.9%, including the 1.7% at Tesco and 11.1% for Booker. Group sales fell in Asia. Jobs have been lost as he aims to save £1.5bn a year and up to 9,000 roles were put at risk in January when the chain announced it would close food counters in 90 stores. 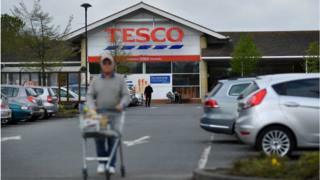 He has also launched a discount chain, Jack's, to take on German rivals Aldi and Lidl, which Tesco said had received a "strong response" in the eight new stores. The proposed tie-up between Sainsbury's and Asda, which is currently being investigated by the competition authorities, could further change the landscape, said Julie Palmer, partner at Begbies Traynor. "External threats are also putting pressure on the retailer with continued uncertainty due to Brexit and the turbulent High Street conditions, evidenced by its decision to cut up to 9,000 jobs by shutting the fresh food counters at 90 stores. "With Marks & Spencer's tie up with Ocado and Amazon's new grocery arm, Amazon Fresh, Dave Lewis will be wary of standing still and instead will want to keep moving," she said. The chain said it would set out some "untapped value opportunities" at a presentation in June. Booker "bulk buys" are already being offered in 70 Tesco stores and will be expanded this year, while Jack's will also be expanded. Mr Lewis has previously said that in the lead-up to Brexit Tesco was focusing on how to ensure movements of fresh food were not held up. As he presented the results on Wednesday, he said Tesco had been building stock of "non-perishable" goods such as canned food ahead of a possible no-deal exit from the European Union. But he added Tesco had not seen any "discernible change in behaviour" from customers during the period of Brexit uncertainty, with no evidence of stockpiling from customers. Mr Lewis said that Tesco's stockpiling was a "sensible provision" but that he hoped a no deal exit would not happen. The shares rose 2% in early trading while the dividend is increasing to 5.77p a share from 3p the previous year.